GOG boss Lukasz Kukawski says videogame DRM isn't just a waste of time, it can actually drive gamers to piracy. We all know that GOG doesn't like DRM. The classic games it sells at gog.com are DRM-free, as is its version of the upcoming Witcher 2, the only edition of the game available without copy protection. But it's not just futile and inconvenient; Kukawski believes the industry's heavy-handed approach to DRM is actually having the opposite of its intended effect. "What I will say isn't popular in the gaming industry but in my opinion DRM drives people to pirate games rather than prevent them from doing that," he told bit-tech.net. "Would you rather spend $50 on a game that requires installing malware on your system, or to stay online all the time and crashes every time the connection goes down, or would you rather download a cracked version without all that hassle?" "I know people that buy an original copy of the game just so they don't feel guilty, and then they will play a pirated version which is stripped of all DRM," he added. "That's not how it should be." The studio is putting its money where its mouth is with The Witcher 2, the long-awaited follow-up to the hit 2007 RPG The Witcher. The game will be GOG's biggest-ever launch and, Kukawski hopes, will also help make a point. "We are making a bold step by putting up this highly-anticipated title without any sort of DRM," he said. "We believe it's going to be a huge success, which should really open doubters' eyes." But Kukawski was also clear that being anti-DRM does not make him pro-piracy. "Piracy is evil. By pirating a game, a movie, or a song you're stealing from people who put a lot of hard work into creating something for your enjoyment," he said. "That's disrespecting the creator who's providing you with something that adds joy to your day." 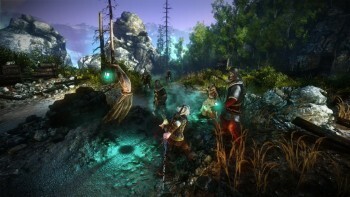 The PC-exclusive Witcher 2: Assassins of Kings comes out worldwide on May17.